Saeed bin Suroor’s Best Solution, last seen finishing fifth in the Dubai Sheema Classic behind Hawkbill, saw the trip out strongly as he held the determined challenge off the well-backed Mirage Dancer. Having seen Charlie Appleby enjoy Derby and Royal Ascot successes this season for Godolphin, Bin Suroor has been quiet by his standards, but appears to have a Group One horse on his hands once more. Mirage Dancer stuck at his task gamely having looked in danger of being swallowed up, but he ultimately went down by half a length to the 6-1 winner, ridden by Pat Cosgrave. 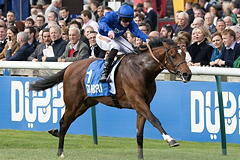 “We gave him a break after he finished fifth in Dubai,” said Bin Suroor. “Today was the race for him, he’d been working well in the morning. There was a question mark about the ground before the race, but when I spoke to the jockey he said the ground was fine for him. “I told him not to rush early, keep him relaxed, because whatever happens he’ll improve a lot for this. He went on: “After he was fifth in the Sheema Classic, we talked to Sheikh Mohammed and said we would give him a bit of time. “In Dubai he ran four times and the time he has taken off has helped him. He missed Ascot and today was target for him. The horse was working really well and has improved physically from last year. “I was just talking to Sheikh Mohammed and it will be the King George or the Irish St Leger (next). “The horse is doing well and we are happy with him. The last furlong I thought he was going well. Sir Michael Stoute said of the gallant Mirage Dancer: “It was a good performance, a very game performance. He has run a super race. Going back to a mile and a half suits him. You can do anything with him. Andrew Balding could look at the Melbourne Cup for third home Duretto. He said: “I’m very pleased with him. He’s a high-class horse. He is rated 114 and it is a bit insulting he was 25-1, really. “He’s run a really good race and we will have to look at our Australian options now and work back from that. “The intention was to win a nice race here (in Europe) and then go to Melbourne. It is an expensive trip and we want to make sure we have the horse of the right sort of calibre, which he seems to be. The Princess of Wales's Stakes is named in honour of Alexandra of Denmark, who became the Princess of Wales in 1863. It was established in 1894, and the inaugural running was won by Isinglass. In its early history, the race was one of the British season's most valuable and prestigious all-aged races. It was initially contested over a mile, and it was extended to its current distance in 1902. The present system of race grading was introduced in 1971, and for a period the Princess of Wales's Stakes was classed at Group 3 level. It was promoted to Group 2 status in 1978. It is now held on the opening day of Newmarket's three-day July Festival meeting.